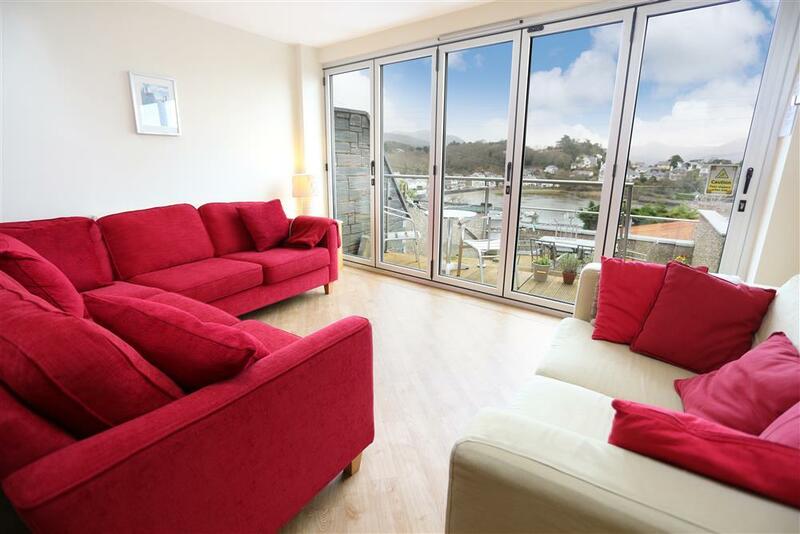 As you sit in the lounge of this house enjoying the views you may think you are enjoying your evening drink on the quarter of a yacht overlooking Borth y Gestbay. This Victorian terraced house is close to the sea front and has beautiful elevated views of the bay and Snowdonia mountains from the lounge and external decking. 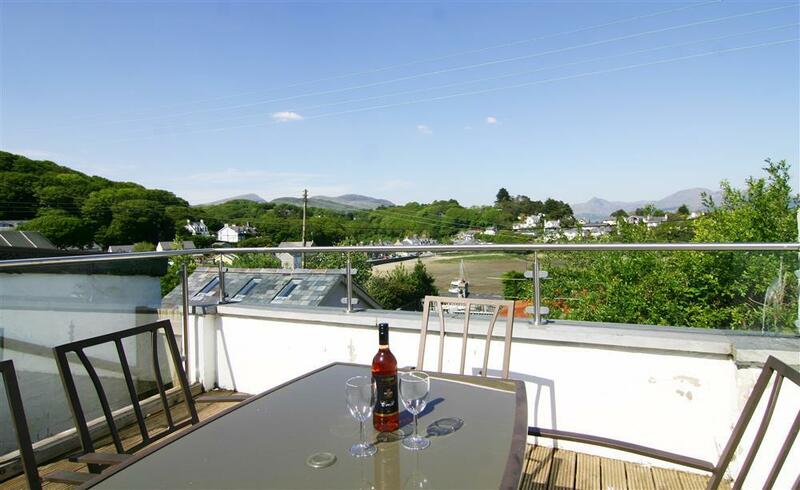 Decorated in a stylish contemporary manner with wooden floors in the living areas and furnished with a mixture of older furniture matching the period of the house, it is a comfortable place to spend a holiday in this quiet seaside village just outside Porthmadog. The excellent state of the art kitchen/diner and two bathrooms makes this a very suitable holiday property for an extended family. There are lovely coastal walks to many sandy beaches and covers nearby, and there is a small playground, village shop, tea room and restaurant within a few minutes walk. In Porthmadog you will be spoilt for choice in shops, restaurants etc. Steam trains travel across the causeway regularly to the delight of young and old alike, a leisure centre is located at the other end of town. Portmeirion village is just a 3 mile walk across the causeway. Cricieth town and castle are 5 mls, Snowdon/Beddgelert village are a beautiful 20 minute drive away. 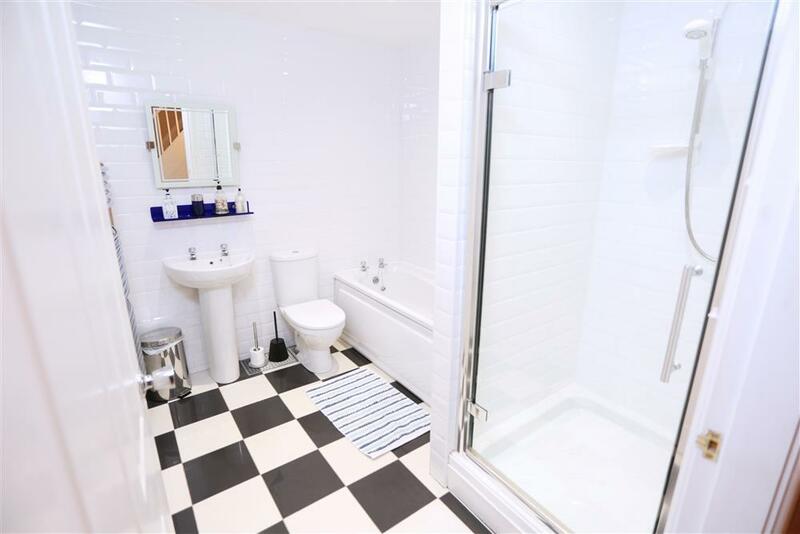 4 BEDROOMS: [Downstairs]: 1 Double bedroom with en-suite bathroom, WC and shower cubicle. 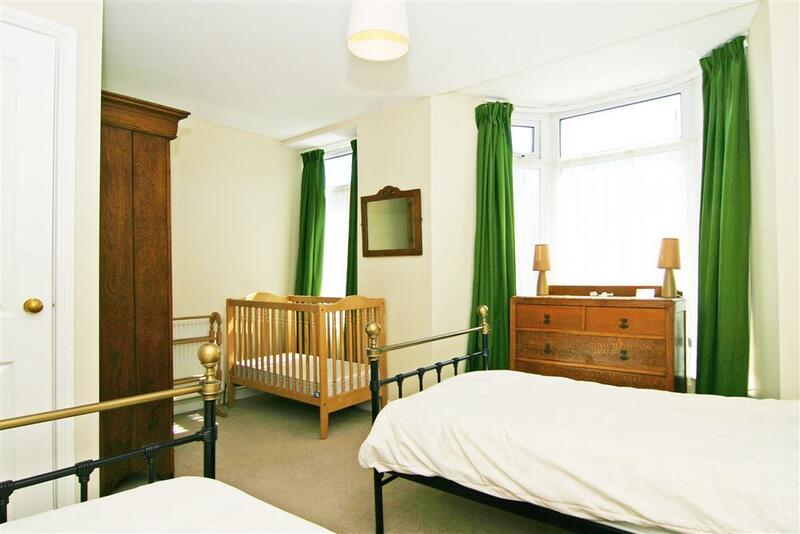 There is an art deco bedroom suite in this bedrooom with no hanging space, but plenty of folding room. [1st floor]:1 Twin bedroom (now noTV as seen in Virtual Tour), 1 Single bedroom (which is a 4' 6" wide bed but with access only from one side), and 1 bedroom with bunk beds. 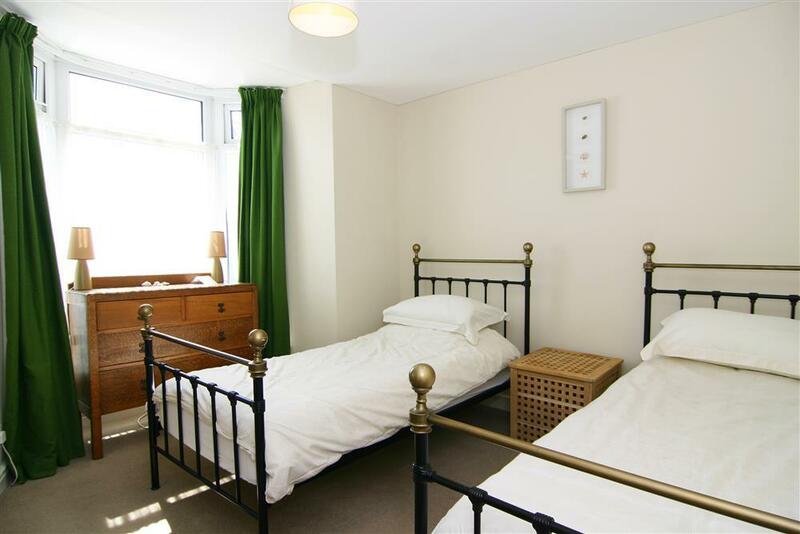 A cot is also available but please check what bedding is provided and that the spec is appropriate before your stay. Bed linen provided, please bring your own towels & tea towels. 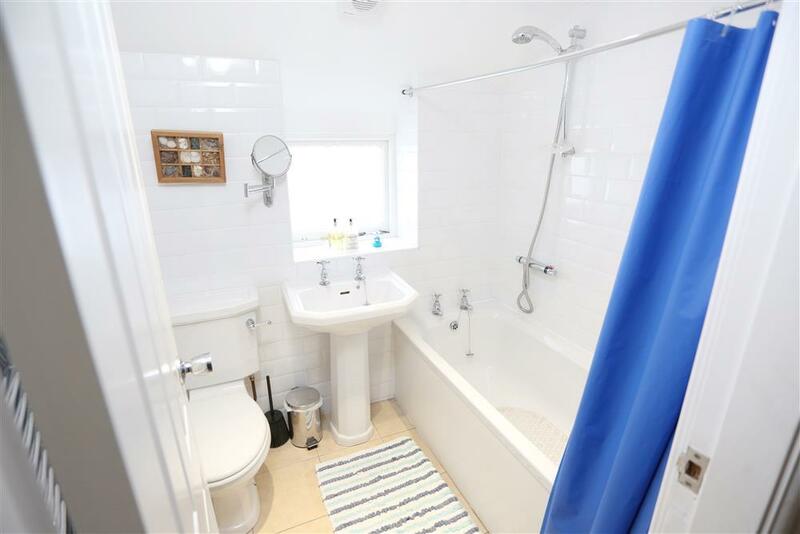 BATHROOM: Bath, WC and shower over the bath. 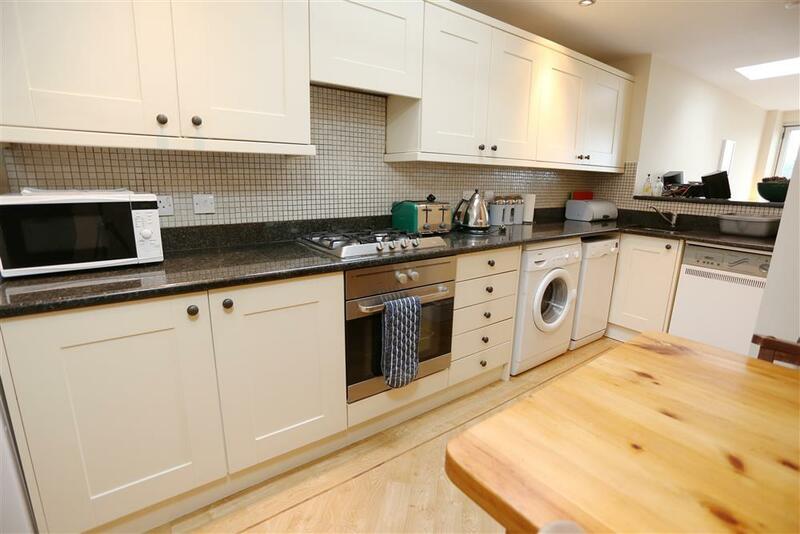 KITCHEN/DINER: Modern fitted kitchen with gas hob, electric oven, microwave, fridge/freezer, dishwasher and washing machine. Dining area is open plan to the compact lounge. 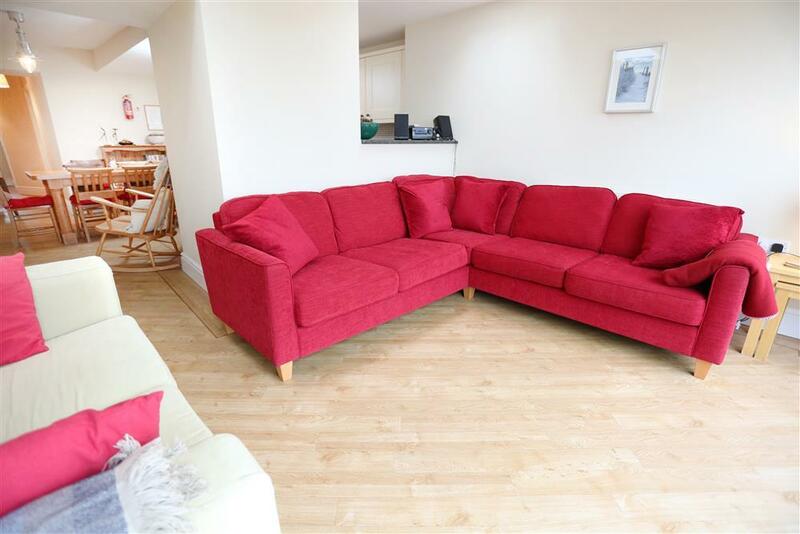 LOUNGE AREA: Compact lounge with large patio doors to balcony which has magnificent views, TV, Freeview and DVD. iPod docking station with CD player and radio. 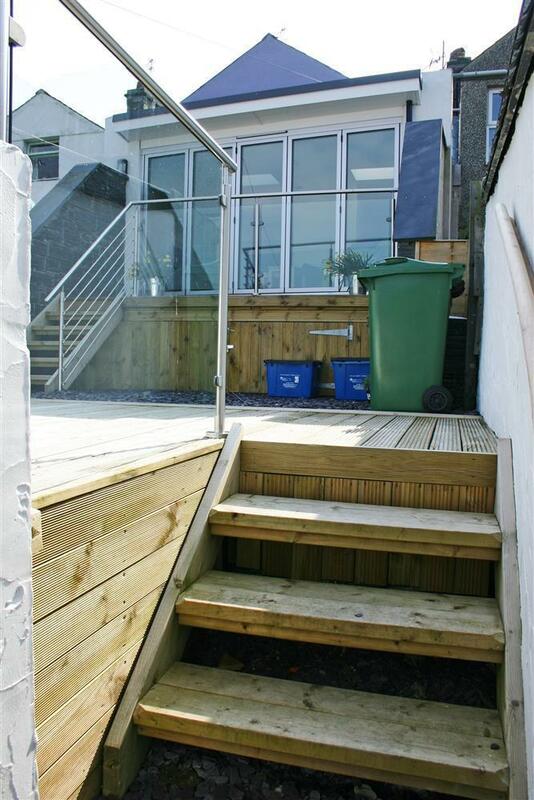 GARDEN: Balcony style decking area with railings off the lounge with another decked area down 4 steps with tables & chairs. The whole area is enclosed. GAS & ELECTRICITY: Reasonable use of electricity and gas included. WiFi: Available at an extra charge of £10 for unlimited number of devices if paid for at the time of booking [please tick WiFi option under the Optional Extras when on the booking page]. N.B. There will be an additional £5 admin charge payable if the WiFi is payed for after the balance paperwork has been sent out. PETS: 2 well behaved dogs. EXTRA:10% Couples Discount available by request out of season (November to end of March, 2 people in only 1 bedroom). Mini-break rules at this cottage: A mini-break is a holiday for less than a week and/or may start on a day which isn't the normal changeover day (Saturday). Between April and the end of October, this property owner will only accept mini-breaks at short notice - either 21 or 14 days before the starting date of the holiday. November to the end of March, 56 days before the start date of the holiday. Mrs W (December, 2018): "Beautiful view from lounge really made the holiday special. 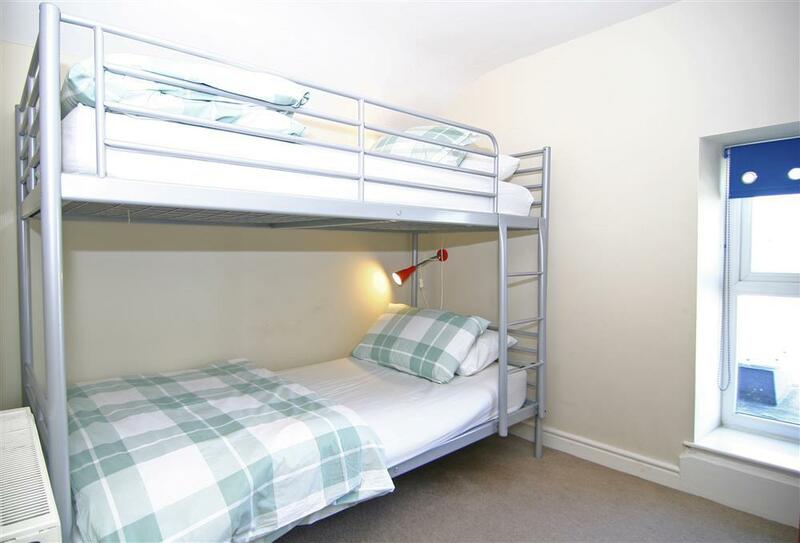 Comfortable beds, clean accommodation, warm Everything you needed for cooking was available if eating in. Perfect location. Lovely beach walks on the doorstep." The McD family (Sept, 2014): "Third stay in this lovely house. Will be back!" The C family (Aug, 2014): "Another lovely holiday. The house suits young and old perfectly." The G family (Aug, 2014): "Had a lovely week in this lovely house with its wonderful views"
The Schreiber family (May, 2014): "Fantastic house fantastic views fantastic holiday!" J, C, W & J (June, 2014): "Our second visit to your lovely home! Very clean on arrival; fantastic weather, great views... Love the beach and want to stay forever. Will be back." The Houghton family (Aug, 2014): "Nice view and comfy beds. Great house because it is next to the beach which we are looking over." The T family: "2nd visit and more of us this time! Fantastic weather and a busy week. Fab house. Suited to 3 generations." 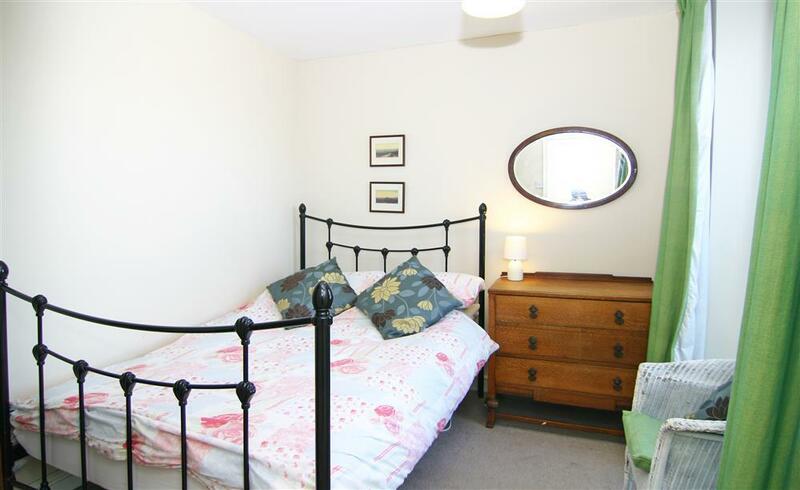 " In the popular village of Borth y Gest this attractive terraced house continues to provide comfortable accommodation with guests able to enjoy outstanding views from the rear. " 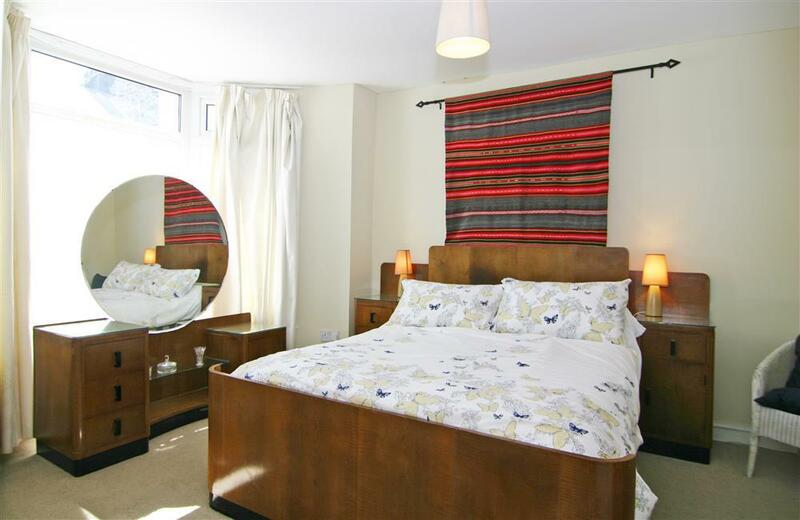 The house has been completely modernised and refurbished in 2007. Parking is available on Ralph Street outside the house. A gate leads you down a short level path to the front door. Access is almost level with 3 low steps - not exceeding 6cm. 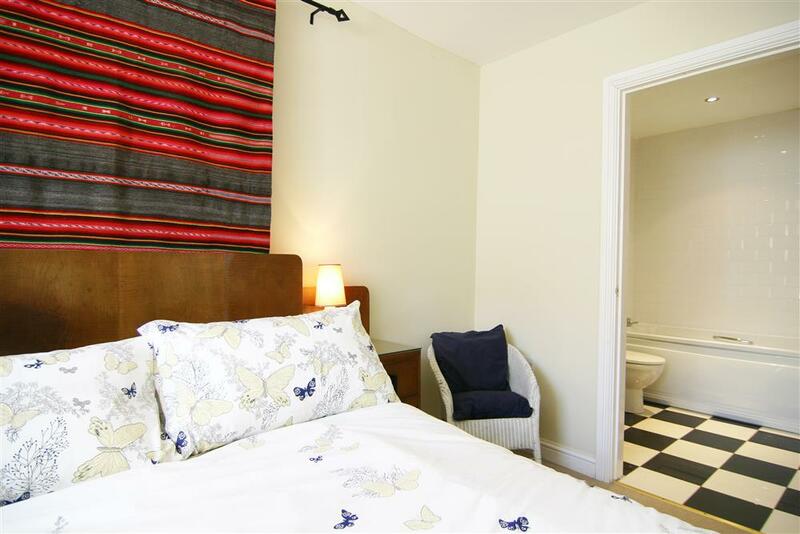 At ground floor level is a double bedroom with a large ensuite bathroom off comprising toilet, sink, bath, and seperate shower. Both are accessed via doors of 82 cm width. The ground floor is all on one level with doorways of approx 760mm. 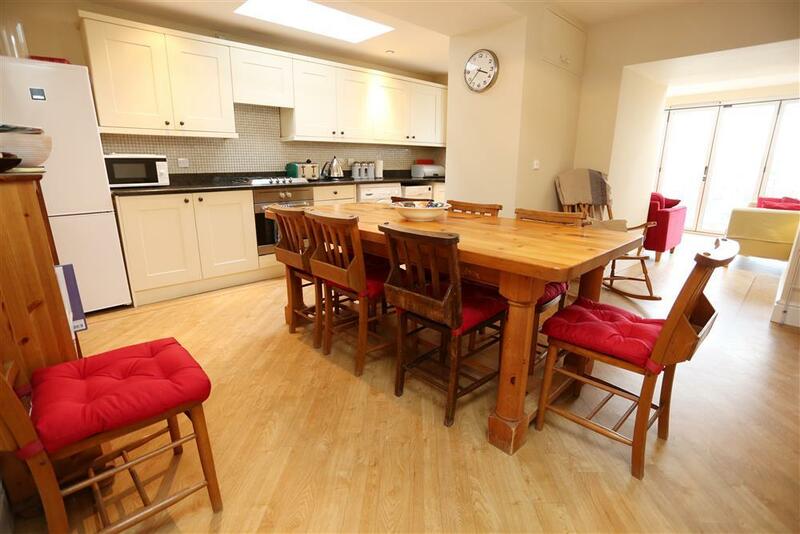 There is an additional entry Otherwise the ground floor level is open plan comprising modern kitchen dining area and rear lounge, with a hall of a width of approximately 110cm (narrowing to approximately 72cm). The rear lounge has a flat screen TV, freeview, DVD and video with remote control. There is no telephone. Overall lighting is good with dressing table lights, side lights and centre lights. Light switches are approximately 120 cm height with electric sockets at approximately 45 cm to 70 cm height, except in the kitchen where some are at worktop height. Outside is a small balcony style terrace leading from the rear lounge with level access with four steps down to a larger decked area, which has a table and chairs. How many nights? 3 nights 4 nights 5 nights 6 nights 7 nights 14 nights 21 nights How many adults? 0 1 2 3 4 5 6 7 How many children? 0 1 2 3 4 5 6 7 How many infants*?